Disclaimer & Terms Home | About Us | Opportunities | Sponsorships | Contact Us! Handmade Men goes above and beyond to ensure that all of the original content we provide is accurate, empowering, and helpful. We contact all shop owners, artists, creators, curators, and collectors in advance to get permission before posting photos, information about them, or links to them on this site. If you feel that we have posted images that belong to you, links to your site, or information about you without your permission, please contact us immediately so that we can remove the material. We are not medical professionals. Any information you get from HandmadeMen.com should be checked with your doctor or other healthcare professional before being implemented in your life. We are not professionals of any specific category including financial, medical, mental health, construction, architecture, contracting, safety, or any other type of licensed or unlicensed professional category. We are not responsible for the content or views held by people we interview, or the content of websites we may link to. We do offer paid advertising, and most ads you see on our site have been paid for. We do not accept payment for reviews or features. Reviews are often based on free samples or review items sent to us. We approach all shops n advance before featuring them on any Hot Picks, Shout Out, or other feature. We do this to create a connection with the shops and to get their permission for use of their images, links, etc. on our site. When we don;t hear back from a shop we approach, we remove them from our contact list. Before you use any of our DIY or how-to features, make sure that you understand all safety aspects of the project. We are not responsible for the choices you make based on information you may read here on HandmadeMen.com or through anyone we link to or refer to. We are in no way affiliated with, sponsored by, or supported by any of the various online marketplaces our features may link to such as Etsy, ArtFire, or Makeably. We’re just fans! Giveaways are not contests or lotteries. 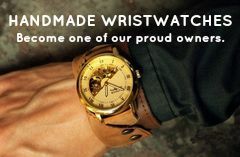 Our sponsors offer free items to randomly selected fans of HandmadeMen.com. Please ensure that participating in these giveaways is legal where you live, and abide by the rules in your jurisdiction. The content on HandmadeMen.com is 100% original. We write all of our own material and work with artisans who create their own photography, text, and graphics. Please honor the hard work we do and don’t steal our text or imagery without contacting us first. We’re more than happy to share if you work with us! We do not accept payment or product in exchange for positive reviews. In most cases shop owners send us samples which we test and review only if we like them. If we have a negative view on an item, we either return it to the shop or choose not to writ e a review. We do accept payment for ad placement. Be safe. Enjoy life. Embrace happy!